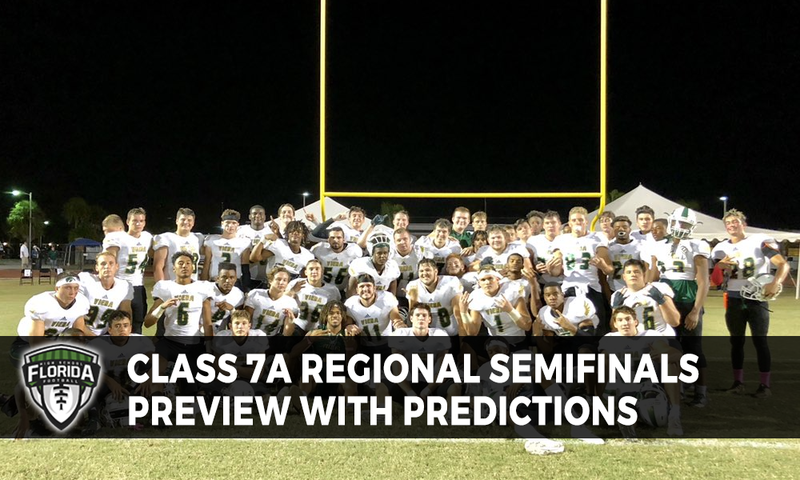 Nothing outside of the expected happened in Class 7A last week in terms of who should have won outside the Bloomingdale-Riverview matchup, leading to some great regional semifinal matchups for this week. A District 7A-2 rematch from Week 4 which saw Columbia defeated Lee at home, 42-37… this is the only the second playoff meeting between Columbia and Lee, Lee winning the last one in 2016 by a score of 43-7 … Last week the visiting Generals defeated No. 4 seed Hagerty, 48-7 … The host Tigers defeated No. 8 seed Fletcher, 38-10 … For Lee, keep an eye on quarterback Cameron Sapp who scored four total touchdowns (three passing, one rushing) last week … With Columbia, the name to know and watch is quarterback Jordan Smith who scored five total touchdowns (four passing, one rushing) on 26-of-48 passes for 449 yards while adding 95 yards rushing … In the last playoff meeting between the two schools in 2016, Derrick Jones and Cameron Wakefield were the forces behind stopping Columbia, according to Florida high school football historian, Richard Burton.